All the clichés about “taking over a room” and “bigger than life” described Jim Taszarek. He was tall, commanding, funny, genuine and he cared about every person in every room he entered. He amassed friends like most of us pick up cheap pens. Just take a look at his Facebook page to see the amazing tributes he has received before and after his death. I met Taz about 10 years ago when we both auditioned to be lectors at the Casa at the Franciscan Renewal Center in Paradise Valley. Lectors read parts of the Bible at mass in the Catholic Church. Taz was really good in that audition and I am pretty good myself so it was inevitable that the two big dogs would sniff around each other. We quickly determined we both had done alright in the media business. Taz had been general manager at KMOX and KTAR and I knew I was talking to a real player in the radio business. Only later did I really cotton to what a legend he was. It also emerged that I was a professor at the Walter Cronkite School. Taz loved the school and had been active in the school’s endowment board for many years. 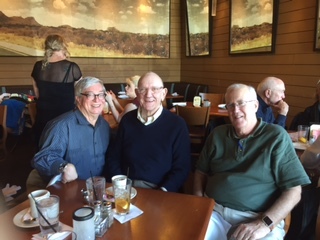 We soon started having coffee and lunch and he introduced me to another major broadcasting figure John Dille. You were a fool if you let Taz’s jokes and insults define him. Taz was a man of significant substance, incredible creative talent and a deep spiritual connection. His intellectual curiosity and his drive to do things better made him a force of nature. Four encounters reveal much of what you need to know about Taz. One day in late May of 2014 I stopped at a store next to Chompie’s in Scottsdale. Taz and his kind, calm wife Sharon were walking into the restaurant for a late lunch. They knew my wife was very ill and they invited me to join them “just to talk.” Taz knew I was hurting and both Taz and Sharon encouraged me to spill out my heart. They counseled lightly but they also were learning about what a fatal illness does to a couple. Taz had been sick for a few years and they both knew my path could soon be their path. They listened, they comforted and I think they had a bit of a clue that they were a life preserver for my sinking boat. My wife Jean died three weeks later in Minneapolis. After I returned to Scottsdale in August, Taz invited me out to dinner for one of the most wonderful meals of my life. We joked some, as we always did, but the conversation focused on grief and spirituality. He wanted to know everything he could find out about hospice and my grief. It was obvious he was making his own preparations and he wanted to make life as easy as possible for his beloved Sharon. We also talked about our spiritual adventures and misadventures. Taz never made a secret of his long-time Alcoholics Anonymous (AA) membership, but that night he slipped into almost a holy reverie of sorts. I distinctly remember him staring off into space and praising the deeply spiritual aspects of AA. He talked with awe of the Power that brought him back from dangerous, self-destructive behavior. He and his God were good. About a year later I needed to connect a friend with AA. I called Taz and told him what I needed. He said “Stay by your phone. ” Within 20 minutes he called back and simply uttered a name and a number. No questions, no pushing for the friend’s name. He had a favor to do for a friend and he did it. The final encounter was January 25 a month before he died. Taz had told John and me in December that he was now in palliative care. We laughed some more, gossiped some more but Taz was especially interested in hearing about the Cronkite School and Dean Chris Callahan. Taz wanted to write a letter to the dean applauding the tremendous strides the school has made. Taz was thinking about sending “attaboys'” when he knew the end was near. Taz had scores of friends because he knew how to be a friend. He made you feel like a special person every time you saw him. Sure he made you laugh, but he also hugged you close with his deep sense of caring and the loving humanity he wore on his sleeve. When Taz was leaving that day he promised us “one more of these lunches before it’s over.” I wrote him Monday to take him up on his promise, not knowing he was two days from the end. I cried Thursday night when I heard the news of his death and I will cry for a while. Knowing there will be no more of those fantastic lunches, no more ribald insults and no more caring makes me profoundly sad. One of the greatest characters, one of the most vital and most genuine men I have ever known has passed. Rest in Peace, good friend, and know that you made thousands of lives so much better. That should be all the Big Guy upstairs needs to know. A long look at someone, a few brief words out of their mouth or a few lines of background can lead me to pretty complete judgments about people. I am not proud of it, but I jump to conclusions about people all the time. It’s that old judging “books by their cover” thing and I am a huge culprit. But brother, you better not try to judge me. A person from my past thinks I made a terrible mistake marrying 15 months after my late wife’s death. The person has been pointed about expressing dismay and has even refused to break bread with my wife and I. This has made me hopping mad. I have obsessed about it far too much. I imagine the harsh things I would say to the person if I get a chance. I constantly construct arguments about how wrong the judgement is and I live in befuddlement why the person thinks my actions are any of their business in the first place. And yet, what I keep coming back to is I have judged that person in the past and never gave it a second thought. Increasingly, when I judge others I find myself jerked back to the ugly fact that I am doing exactly what I despise. Certainly some of us have to judge people as a part of what we do. When people worked for me I needed to judge their performance. And, I obviously judge and grade the work of my students. But judging whether people are making the correct choices or following the right life path is silly, mean and even vicious because we have no idea of the person’s backstory, motives or needs. When we judge people’s choices and actions, when it’s really none of our business, we are insisting that our own frame and values are perfect for everyone. That, is of course, poppycock. That arbitrary judging is wrong is certainly not a new discovery for me, but I have found that my anger over being judged has dramatically increased my sensitivity to my own judgmental ways. If I had a nickel for every time I mistakenly jumped to conclusions about people I’d have a huge bucket load of nickels. Perhaps the recent scars of being judged myself will produce a few less nickels as I move forward. And, I hope my realization that I am often guilty of mean judgments can also lead me toward the path of forgiveness.